The Information and Communication Technology Association in Jordan – (Intaj) have signed up to take part in the ninth edition of Bahrain information and communication technology MEET ICT Conference & the Bahrain International Technology Exhibition BITEX 2019, held under the patronage of Transportation and Telecommunications minister Kamal bin Ahmed at the Gulf Hotel Bahrain from 19th to 21st of March 2019. During a meeting held at Amman Chamber of Commerce, Intaj, BITEX organizers and 30 officials of members of the association has agreed on their participation in the gala event along with their panel discussions that will be held on the sideline of BITEX exhibition. A Jordanian Pavilion will be allocated at BITEX, were eight Jordanian ICT exhibitors will have the chance to network with local, regional and international ICT companies and Bahrain e-Government system developers participating at BITEX. The gala event will include panel discussions were key topics will be discussed such as; digital transformation, artificial intelligence, internet of things, cyber security, FinTech, e-Commerce and BlockChain. 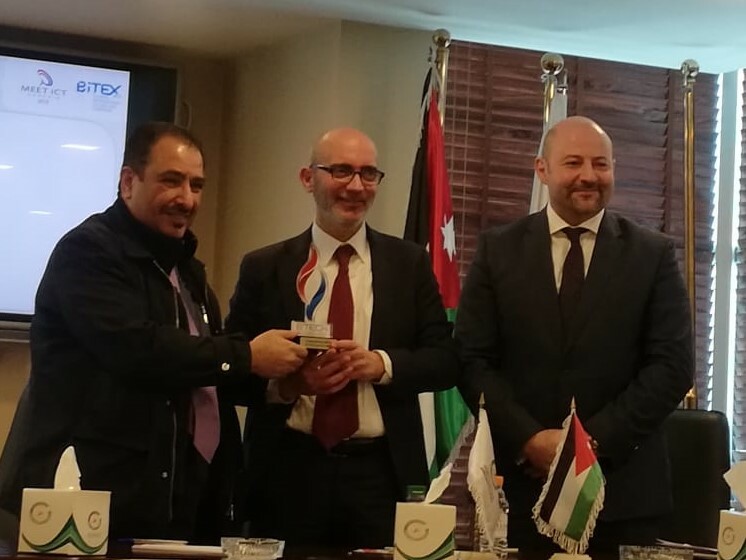 Dr. Bashar Hawamdeh, Chairman of Intaj, encouraged that the Jordanian companies to participate in BITEX 2019 as it provides a platform were exhibitors will create prominent connections with fellow industry experts, digital leaders & senior decision makers, in order to boost the development of smart world. For his part, Mr. Ahmed AL Hujairi, Senior Advisor for Bahrain Technology Companies Society with the organizer of the gala event “WorkSmart”, praised the Jordanian participation that is considered their first in Bahrain, asserting that this participation will boost cooperation between Bahraini and Jordanian companies working for the ICT sector and to gain opportunities that will lead to their business growth. “The Jordanian companies has significant expertise in the ICT sector, part of these companies works internationally, and we are seeking towards coordinating with them and their relevant Bahraini companies through Meet ICT conference and BITEX exhibition, to attain mutual goals and benefit of both parties. As well as sharing their expertise in the MENA region and international markets with the participants in this vital technology event” Said Al Hujairi.